Figure out how to make the standard shore excursions in the busy Alaskan market so special that passengers aboard the Disney Cruise Line’s first-ever trips there this summer will buy its pricier versions. For Stauffer, that meant getting the lumberjacks, dog mushers, gold-panners, helicopter pilots, totem-pole carver, glacier guides, train conductors and fishing boat operators to come up with something distinctively better. 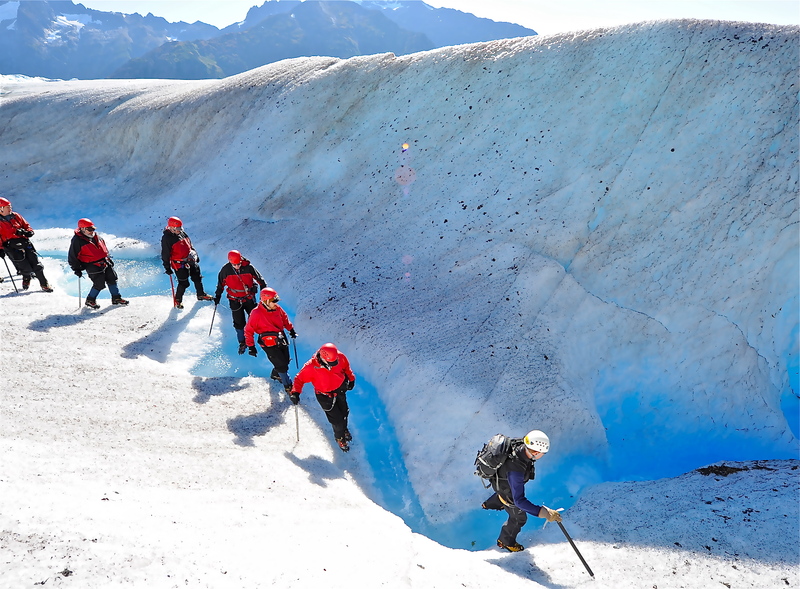 Disney passengers can dress in protective gear and get a helicopter ride to a glacier near Juneau, then set off with ice axes to explore. To achieve that, the manager of Disney Cruise’s Port Adventures (the Mouse’s term for excursions) twice flew from Orlando to Alaska, sampling about 20 excursions, then meeting with the operators. “I absolutely challenged them to come back to us with ideas that were different for Disney. I told them we would be coming with 1,000 kids, told them what we already do on our existing itineraries,’’ Stauffer told me as he led a media tour to the ports last fall. Youngsters help create a new totem pole, portraying a sea monster. Each child will be given paints and a piece of wood bearing a stenciled design – either feathers or gills for the monster. Each newly painted piece will be attached to the 20-foot-tall pole, to be finished by the end of the summer season. For something flashier, the long-running Great Alaskan Lumberjack Show is down-sizing logs and equipment, for shows performed just for Wonder passengers. 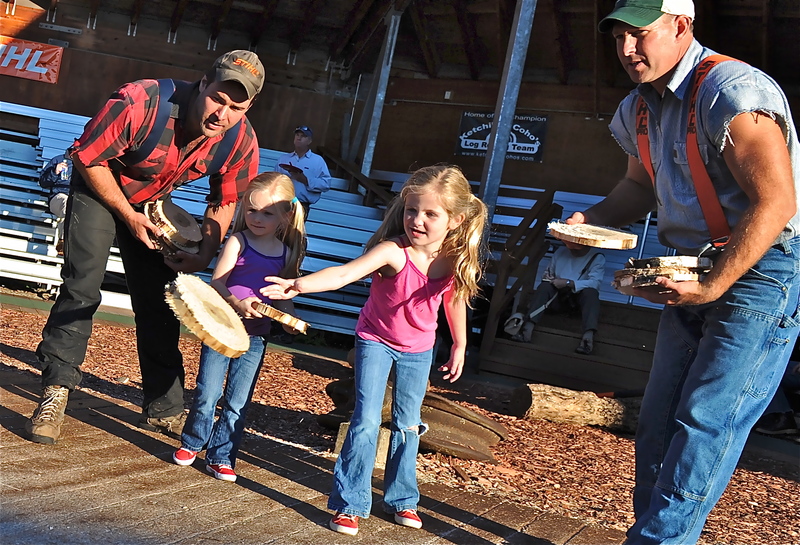 Youngsters get to try their hand at a special version of the Great Alaskan Lumberjack Show, in Ketchikan. The lumberjacks will select about 10 children — as young as 5 – to take part in pint-sized versions of several stunts. Skagway — The famed White Pass & Yukon Route railroad, an engineering marvel when built between 1898 and 1900, carried about 365,000 tourists in 2010 on its 27-mile, narrated, trip. For those Wonder passengers selecting to upgrade, White Pass will form special Disney trains, carrying up to 120. They will get the standard trip as the train chugs up the mountain pass for about 100 minutes. But Signature Collection passengers will stay onboard for the return trip, rather than getting into buses. On the downhill ride, kids will be placed in their own railcar. They will get special activity books, including an I-spy bingo style game to keep them checking the slowly passing scenery. The White Pass & Yukon Route railroad climbs through the same passes as it did when built for the Yukon gold rush. There also will be a costumed character – either a railroad figure or a prospector — spinning tales of the gold rush era. The passengers are then taken to train the attraction named Liarsville. Here, Wonder passengers will watch an exclusive performance of a puppet show and listen to costumed staff explain that the gold prospectors had to carry about a ton of goods to help them survive the harsh winter. The kids will be sent on a scavenger hunt for those supplies, in the tent village that is Liarsville. Next, the youngsters will try panning for gold flakes, with help from the Liarsville staff – and Donald Duck, resplendent in a traditional and matching ear-flaps hat. Juneau — Perhaps the most-spectacular of the Signature Collection trips occurs out of Juneau, atop the Upper Norris Glacier. And that’s without the tourists’ getting to put booties on the dogs to protect their paws – just one of the add-ons fashioned for the Signature passengers. They will also select the lead dog, then help harness the dogs to the sled. Finally, these passengers can take the place of the professional musher – though youngsters will be just holding the sled’s handles while the pro stands behind them on the runners. The trips will be doubled to about four miles. For rates, sailing dates and more information about the Disney Wonder, consult a travel agent or go to http://disneycruise.disney.go.com.